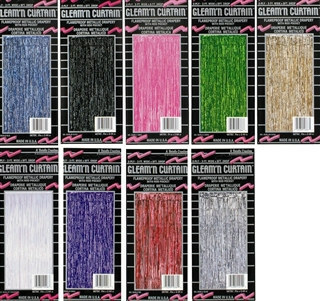 The 2-Ply Gleam N Curtain Metallic Curtain is the perfect way to decorate doorways at your next Oktoberfest, 4th of July, winter dance, graduation, etc. This list is endless. The best fact about the 2-Ply Gleam N Curtain Metallic Curtain is that you can save it and reuse it at a later date. Reusable decorations can be hard to come it. The party decoration is made from a metallic foil that shimmers and shines as light is reflected off it. The curtain measures 3 feet wide and 8 feet long.